Ornithine transcarbamylase (OTC) deficiency is an X-linked genetic disorder of the urea cycle that leads to elevated levels of ammonia in the blood. One of the most enigmatic aspects of OTC is the age of onset, which is often after childhood in otherwise normal individuals. 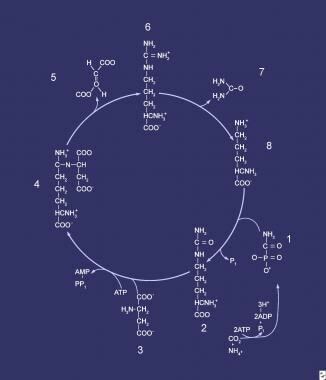 Compounds that comprise the urea cycle are sequentially numbered, beginning with carbamyl phosphate (1). At this step, the first waste nitrogen is incorporated into the cycle; during this step, N-acetylglutamate exerts its regulatory control on the mediating enzyme, carbamoyl phosphate synthetase (CPS). Compound 2 is citrulline, which is the product of condensation between carbamyl phosphate (1) and ornithine (8); the mediating enzyme is ornithine transcarbamylase. Compound 3 is aspartic acid, which is combined with citrulline to form argininosuccinic acid (ASA) (4); the reaction is mediated by ASA synthetase. Compound 5 is fumaric acid generated in the reaction that converts ASA to arginine (6), which is mediated by ASA lyase. The hepatic urea cycle is the major route for waste nitrogen disposal, which is chiefly generated by protein and amino acid metabolism. Low-level synthesis of certain cycle intermediates in extrahepatic tissues makes a small contribution to waste nitrogen disposal. A portion of the cycle is mitochondrial in nature; mitochondrial dysfunction may impair urea production and result in hyperammonemia. Overall, activity of the cycle is regulated by the rate of synthesis of N -acetylglutamate, the enzyme activator that initiates incorporation of ammonia into the cycle. Failure to incorporate carbamyl phosphate into citrulline by condensation with ornithine results in an excess of both substrates for the reaction (see the image below). The consequent increase in hepatic ornithine is often reflected in an elevated serum level. By contrast, excessive mitochondrial carbamyl phosphate finds its way into the cytosol, where it functions as substrate for the carbamoyl phosphate synthetase (CPS) II reaction. This results in orotic acid, which is a normal intermediate in pyrimidine biosynthesis. Pyrimidine biosynthesis is regulated very tightly because it is a pathway involved in nucleic acid biosynthesis; thus, increases in urinary excretion of orotate are rarely observed in normal humans. Neither conversion of CPS to orotate nor hepatic leakage of ornithine can prevent the rapid development of hyperammonemia. One of the most enigmatic aspects of this genetic disorder is the age of onset, which is often after childhood in otherwise normal individuals. The estimated incidence rate of 1:80,000 live births must be viewed with some degree of reservation because late-onset cases may go undetected. More recent estimates place the overall incidence rate of urea cycle defects in the range of 1:20,000, making ornithine transcarbamylase deficiency far more common than the previous estimate. As with the other urea cycle enzyme defects, clinical onset is often rapid and devastating in a patient who is genetically affected; however, in older individuals, the initial onset can occur at age 40-50 years or older. Morbidity and mortality are high, especially in patients with the neonatal form. As an X-linked trait, ornithine transcarbamylase deficiency is somewhat unusual among inherited biochemical disorders. Carried on the X chromosome, the mutant ornithine transcarbamylase gene regularly manifests in hemizygous males; although, as mentioned above, the age of clinical onset can be unpredictable. Based on reports in the literature, many heterozygous females are also seriously affected, occasionally suffering mental retardation and even death from hyperammonemia. The severity of disease in carrier females is conditioned by the nature of the mutation and the random inactivation of the mutant gene, according to the Lyon hypothesis. Most affected male infants with neonatal presentation have not escaped the initial episode with normal mentation. Nonetheless, survival for many years can be achieved with very careful monitoring; use of oral citrulline, benzoate, and phenylacetate; and scrupulous dietary attention. Prognosis for older males with initial onset remains unclear because so many remain undiagnosed until very late in the clinical course. Most heterozygous females appear to be relatively healthy, except for a propensity to develop severe headaches with high protein intake. Women and children who are mildly affected can have an excellent prognosis with proper care. The X-linked nature of the mutation leads to a 1:2 chance of recurrence in any subsequent male conceptus if the mother is a carrier. All female siblings of the obligate heterozygous maternal carrier are potential carriers, whereas male siblings may be at risk for late-onset presentation. The second reason is derived from the first. Another compelling issue in family counseling is the overwhelming sense of guilt with which the carrier mother must deal. Finally, repeatedly reinforce the parents in their abilities to perceive early signs of hyperammonemia and to take immediate steps to obtain medical care. Prenatal diagnosis is possible. Brooks M. FDA Clears Drug for Urea Cycle Disorders. Medscape Medical News. February 1, 2013. Available at http://www.medscape.com/viewarticle/778646. Accessed: February 9, 2013. Crosbie DC, Sugumar H, Simpson MA, Walker SP, Dewey HM, Reade MC. Late-onset ornithine transcarbamylase deficiency: a potentially fatal yet treatable cause of coma. Crit Care Resusc. 2009 Sep. 11(3):222-7. [Medline]. [Guideline] Pearlman E, National Headache Foundation. Special treatment situations: pediatric migraine. Standards of care for headache diagnosis and treatment. 2004. 98-107. [Full Text]. Wang L, Morizono H, Lin J, Bell P, Jones D, McMenamin D, et al. Preclinical evaluation of a clinical candidate AAV8 vector for ornithine transcarbamylase (OTC) deficiency reveals functional enzyme from each persisting vector genome. Mol Genet Metab. 2012 Feb. 105(2):203-11. [Medline]. [Full Text]. Caldovic L, Abdikarim I, Narain S, et al. Genotype-phenotype correlations in ornithine transcarbamylase deficiency: a mutation update. J Genet Genomics. May 2015. 42:181-194. [Medline]. Walker V. Ammonia toxicity and its prevention in inherited defects of the urea cycle. Diabetes Obes Metab. 2009 Sep. 11(9):823-35. [Medline]. Kim HJ, Park SJ, Park KI, Lee JS, Eun HS, Kim JH, et al. Acute treatment of hyperammonemia by continuous renal replacement therapy in a newborn patient with ornithine transcarbamylase deficiency. Korean J Pediatr. 2011 Oct. 54(10):425-8. [Medline]. [Full Text]. Gascon-Bayarri J, Campdelacreu J, Estela J, Reñé R. Severe hyperammonemia in late-onset ornithine transcarbamylase deficiency triggered by steroid administration. Case Rep Neurol Med. 2015. 2015:453752. [Medline]. Bergmann KR, McCabe J, Smith TR, et al. Late-onset ornithine transcarbamylase deficiency: treatment and outcome of hyperammonemic crisis. Pediatrics. April 2014. 133:e1072-1076. [Medline]. Arranz JA, Riudor E, Marco-Marin C, et al. Estimation of the total number of disease-causing mutations in ornitine transcarbamylase (OTC) deficiency. Value of the OTC structure in predicting a mutation pathogenic potential. J Inherit Metab Dis. 2007 Apr. 30(2):217-26. [Medline]. Brassier A, Gobin S, Arnoux JB, Valayannopoulos V, Habarou F, Kossorotoff M, et al. Long-term outcomes in Ornithine Transcarbamylase deficiency: a series of 90 patients. Orphanet J Rare Dis. 2015 May 10. 10:58. [Medline]. Arn PH, Hauser ER, Thomas GH, Herman G, Hess D, Brusilow SW. Hyperammonemia in women with a mutation at the ornithine carbamoyl transferase locus. A cause of postpartum coma. N Engl J Med. 1990 Jun 7. 322(23):1652-5. [Medline]. Batshaw ML, Roan Y, Jung AL, et al. Cerebral dysfunction in asymptomatic carriers of ornithine transcarbamylase deficiency. N Engl J Med. 1980 Feb 28. 302(9):482-5. [Medline]. Berry GT, Steiner RD. Long-term management of patients with urea cycle disorders. J Pediatr. 2001 Jan. 138(1 Pt 2):S56-S62. [Medline]. Campbell AG, Rosenberg LE, Snodgrass PJ, Nuzum CT. Ornithine transcarbamylase deficiency: a cause of lethal neonatal hyperammonemia in males. N Engl J Med. 1973 Jan 4. 288(1):1-6. [Medline]. Cordero DR, Baker J, Dorinzi D, Toffle R. Ornithine transcarbamylase deficiency in pregnancy. J Inherit Metab Dis. 2005. 28(2):237-40. [Medline]. Drogari E, Leonard JV. Late onset ornithine carbamoyl transferase deficiency in males. Arch Dis Child. 1988 Nov. 63(11):1363-7. [Medline]. Finkelstein JE, Hauser ER, Leonard CO, Brusilow SW. Late-onset ornithine transcarbamylase deficiency in male patients. J Pediatr. 1990 Dec. 117(6):897-902. [Medline]. Fox J, Hack AM, Fenton WA, et al. Prenatal diagnosis of ornithine transcarbamylase deficiency with use of DNA polymorphisms. N Engl J Med. 1986 Nov 6. 315(19):1205-8. [Medline]. Galloway PJ, MacPhee GB, Galea P, Robinson PH. Severe hyperammonaemia in a previously healthy teenager. Ann Clin Biochem. 2000 Sep. 37 (Pt 5):727-8. [Medline]. Gilchrist JM, Coleman RA. Ornithine transcarbamylase deficiency: adult onset of severe symptoms. Ann Intern Med. 1987 Apr. 106(4):556-8. [Medline]. Gyato K, Wray J, Huang ZJ, et al. Metabolic and neuropsychological phenotype in women heterozygous for ornithinetranscarbamylase deficiency. Ann Neurol. 2004 Jan. 55(1):80-6. [Medline]. Hauser ER, Finkelstein JE, Valle D, Brusilow SW. Allopurinol-induced orotidinuria. A test for mutations at the ornithine carbamoyltransferase locus in women. N Engl J Med. 1990 Jun 7. 322(23):1641-5. [Medline]. Lee B, Yu H, Jahoor F, et al. In vivo urea cycle flux distinguishes and correlates with phenotypic severityin disorders of the urea cycle. Proc Natl Acad Sci U S A. 2000 Jul 5. 97(14):8021-6. [Medline]. [Full Text]. Legras A, Labarthe F, Maillot F, et al. Late diagnosis of ornithine transcarbamylase defect in three related femalepatients: polymorphic presentations. Crit Care Med. 2002 Jan. 30(1):241-4. [Medline]. Maestri NE, Brusilow SW, Clissold DB, Bassett SS. Long-term treatment of girls with ornithine transcarbamylase deficiency. N Engl J Med. 1996 Sep 19. 335(12):855-9. [Medline]. [Full Text]. McCullough BA, Yudkoff M, Batshaw ML, et al. Genotype spectrum of ornithine transcarbamylase deficiency: correlation with the clinical and biochemical phenotype. Am J Med Genet. 2000 Aug 14. 93(4):313-9. [Medline]. Morioka D, Kasahara M, Takada Y, et al. Current role of liver transplantation for the treatment of urea cycle disorders: a review of the worldwide English literature and 13 cases at Kyoto University. Liver Transpl. 2005 Nov. 11(11):1332-42. [Medline]. Nicolaides P, Liebsch D, Dale N, et al. Neurological outcome of patients with ornithine carbamoyltransferase deficiency. Arch Dis Child. 2002 Jan. 86(1):54-6. [Medline]. Riudor E, Arranz JA, Rodes M. Partial ornithine transcarbamylase deficiency. Pediatrics. 2003 May. 111(5 Pt 1):1123-4; author reply 1123-4. [Medline]. [Full Text]. Takanashi J, Barkovich AJ, Cheng SF, et al. Brain MR imaging in neonatal hyperammonemic encephalopathy resulting from proximalurea cycle disorders. AJNR Am J Neuroradiol. 2003 Jun-Jul. 24(6):1184-7. [Medline]. [Full Text]. Takanashi J, Kurihara A, Tomita M, et al. Distinctly abnormal brain metabolism in late-onset ornithine transcarbamylasedeficiency. Neurology. 2002 Jul 23. 59(2):210-4. [Medline]. Tuchman M, Matsuda I, Munnich A, et al. Proportions of spontaneous mutations in males and females with ornithine transcarbamylase deficiency. Am J Med Genet. 1995 Jan 2. 55(1):67-70. [Medline]. Tuchman M, McCullough BA, Yudkoff M. The molecular basis of ornithine transcarbamylase deficiency. Eur J Pediatr. 2000 Dec. 159 Suppl 3:S196-8. [Medline]. Wakiya T, Sanada Y, Urahashi T, Ihara Y, Yamada N, Okada N, et al. Impact of enzyme activity assay on indication in liver transplantation for ornithine transcarbamylase deficiency. Mol Genet Metab. 2012 Mar. 105(3):404-7. [Medline]. Wilcken B. Problems in the management of urea cycle disorders. Mol Genet Metab. 2004 Apr. 81 Suppl 1:S86-91. [Medline]. Yamaguchi S, Brailey LL, Morizono H, Bale AE, Tuchman M. Mutations and polymorphisms in the human ornithine transcarbamylase (OTC) gene. Hum Mutat. 2006 Jul. 27(7):626-32. [Medline]. Prasun P, Altinok D, Misra VK. Ornithine transcarbamylase deficiency presenting with acute reversible cortical blindness. J Child Neurol. May 2015. 30:782-785. [Medline].